Out of all the dorm essentials that you need to bring with you to college, your Twin XL bedding is probably the most important. In a dorm room, your extra long Twin bedding should be relied on to provide you with soft comfort as well as a stylish look to go best with the rest of your college decor. With so much riding on your dorm bedding, you will probably want to make sure you pick out the very best Twin XL bedding accessories. The right oversized Twin XL comforter and college sheets can make or break your dorm bed, and the perfect standard size pillowcases can really bring home the style and comfort you want on your Twin extra long bed. If unique style and soft comfort is what you want for your essential bedding pillowcase, you've come to the right place. 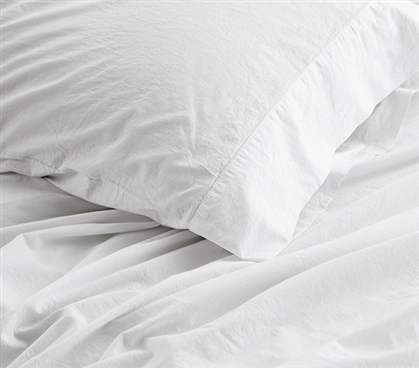 Our one of a kind 200TC Saudade Portugal Pillowcases - Washed Percale (2-Pack) are made with the highest standards to give you the best college bedding for your dorm room. These high quality pillowcases are made with comfy cotton percale material that will feel extra cozy when it is time for bed (or a nap) on your dorm bed. Made in Portugal with the finest Twin XL bedding materials and with a classic style, this white pillowcase set will add a sophisticated look to your Twin XL bedding and your dorm room decor, making it an even more essential part of your college bedding.